This one’s dedicated to Ellie T.
Too Funny!! Thanks for the laugh. Actually, if you look at it that way, perhaps you could argue that the loneliest number would be the number 0.999… and of course that’s equal to 1/3 + 1/3 + 1/3, or 3/3, which is in fact the number 1. Oh, BRILLIANT! 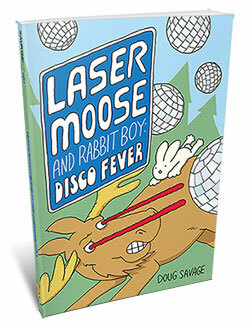 Especially like the music tie-in. Not only that, he is so hard to understand, being both irrational and transcendental. 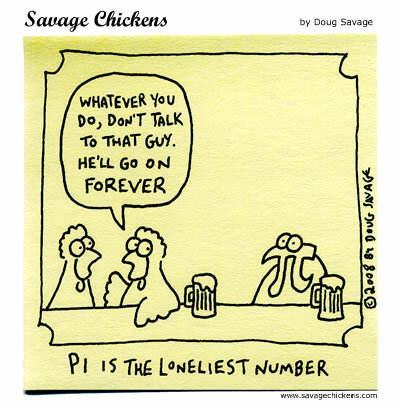 Poor Pi. I know! People say he’s irrational and he’s always talking in circles. But at least he doesn’t repeat himself like some constants. Pi isn’t lonely, he has a whole day to himself! i is far lonlier, no one knows if he actually exists. This one is perfect for a mug for us CS geeks! I’ve known people that spoke in circles too. Every thought is a tangent, returning to a basic theme. What was I saying? I don’t know, I tuned out for a minute. Yes! Happy Pi day everybody! I almost forgot! Maybe 3 Dog Night can release this version! He would not be so lonely if he would just shut his pi-hole for once. This brings back some nice memories of the only Pi Day I ever really observed. Thanks, Doug. Am I the only one who noticed that Pi looks like a turkey? Keep up the good work Doug. This was worth 22/7 of a good laugh! Speaking of Pie Day, my sister made two pizzas. Well, one of them was round and the other was a rectangle. I ate the rectangle cheese pizza. I feel so bad for not joining in on the celebration! Well, the rest of my family did. I almost forgot – I did taste the crust of the round one. Technically, I celebrated, too! the Greek Letter ? is supposed to be pronounced like our English letter P.
As with any other Greek Letter that we spell with an “i” at the end. They should be pronounced Pee, Phee, Chee (the CH makes a very guttural sound), Psee, Ksi, respectively. So really… today is “Pee” day. And I think I’m going to celebrate right now. I’ve been catching up on my Savage Chickens today and this one is my favourite. I came to know about this site recently, was going through it. P.S- Maybe coz im a maths student. lol. I <3 this, keep up the good work Doug!!! Happy Pi(n)-DAY, AND HAPPY BIRTHDAY to ME!! !